We have three new polls today, including all-important Florida. Zogby's poll of Florida posted yesterday had Kerry 1% ahead. A Gallup poll taken a day later has Bush 2% ahead, so we now award Florida to Bush for the moment. Both of these polls are within the MoE so the state is still a statistical tie. The Gallup poll was based on 1002 people, so the 3% change was based on 30 additional Bush supporters in Gallup's sample compared to Zogby's. That's tiny, yet the electoral college gap narrowed today by 54 votes. That goes to show how close the race is in Florida. It may well be that the final polls on Nov. 1 say Bush will be in the range 48% to 52% and Kerry will be in the range 48% to 52%. We may have to wait until all the votes are counted--several times-- before we know. Today's map is probably giving Karl Rove nightmares. Missouri and Colorado are currently tied but suppose Bush squeaks through in both and the Colorado referendum fails. 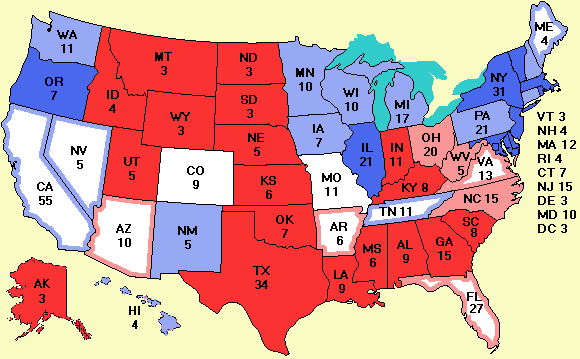 Then Bush picks up 20 votes in the electoral college and the score would be Kerry 280, Bush 258. In that scenario, Bush has won the three critical states: Florida, Ohio, and Missouri, and still lost the election. It could happen. That's why battles are raging in some of the smaller states, like Nevada, New Mexico, and West Virginia. Many people have asked me what gives with California. There was a poll from Survey USA on Aug. 18 where Kerry's margin was only 3%. I don't believe that for a second, just as I am not convinced that Kerry is leading in Tennesse or that Colorado is a tie. Remember even with the impeccable methodology and no monkey business, about 5% of the time you get a sample mean that is more than two standard deviations from the true mean just due to bad luck. My best guess is that is what happened in California. To bookmark this page, type CTRL-D. If you are visiting for the first time, welcome. This site has far more about the election than just the map. See the Welcome page for more details.